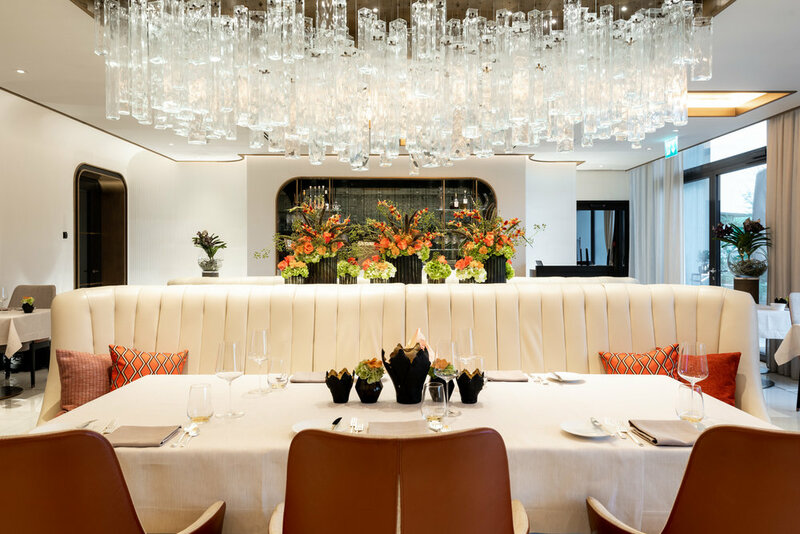 Located in one of Zürich’s top hotels — the Atlantis by Giardino — Ecco Zürich is a delightfully unassuming restaurant. Given the fact that it has recently received 2 Michelin stars you’d be forgiven for thinking that the restaurant might feel stuffy (it doesn’t) or that the wait staff might be pretentious (they most certainly are not), or that you need to be a food and wine expert to appreciate the creative food being served here (you don’t). But that’s what makes this restaurant so interesting — it’s almost the opposite of what a 2 Michelin star restaurant should be. Of course, it’s delicious and the setting is elegant— but it’s also relaxed, and causal, and it’s the perfect place to go for a night out in Zürich. Our initial impression of the restaurant came when we first checked into the hotel. We had dinner reservations at Ecco that night, so when we inquired with the hotel manager about the restaurants dress code, we were pleasantly surprised when he smiled and told us that Ecco Zürich does not have a dress code and that we were welcome to arrive in what ever manner made us most comfortable. This is certainly rare for such a highly ranked restaurant, and we were excited to find out that this come-as-you-are attitude permeates into the dining room's aesthetic. Ecco has an elegant décor, but despite this, it retains a warm, inviting vibe. It's a wonderful, white tablecloth dining experience -- with out the stuffiness that typically accompanies white tablecloths. Ecco is the third restaurant that chef Rolf Fliegauf founded -- and is currently headed by Stefan Heilemann, his former sous-chef. 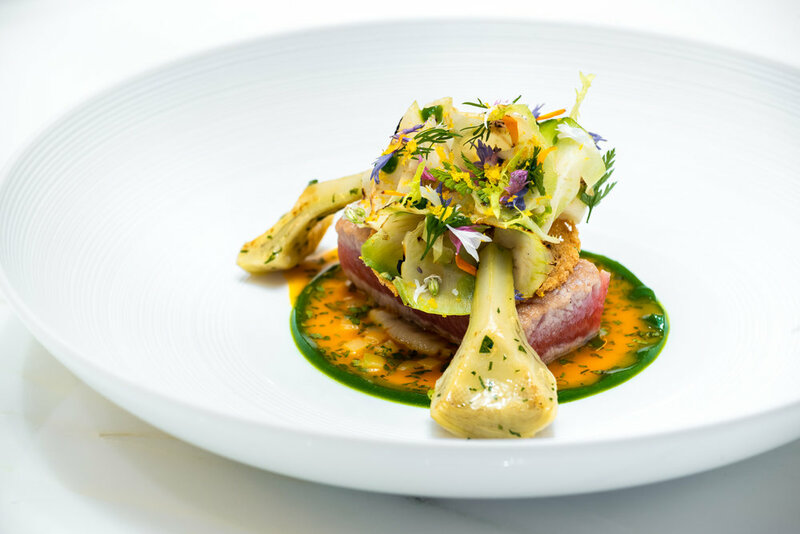 Chef Heilemann use seasonal ingredients and his experiments with texture and temperature are the signature components of his dishes. His creatively and skill have brought him to restaurants around the world, including stints as a guest chef at Hurawahi Maldives and Banyan Tree Phuket. Given the chefs reputation, we were delighted that we had an opportunity to chat briefly with him before sitting down for dinner. Over the course of the conversation, he told us about how he draws inspiration from Thai cuisine, and his face lit up when we discovered our shared love of Panang curry — which he noted was his favorite dish to prepare while at home. Throughout our courses, which featured ingredients such as Thai spices and curries, we could really taste the rich flavors of Thailand, which was a wonderful surprise to find in Switzerland. For the evening, Chef Heilemann suggested that Chris and I try the tasting menu so that we could sample a wide range of dishes — and we were not disappointed! From the rich flavor profiles to the artful plating, each course boasts creativity and technical prowess. As we were eating, I felt like each dish was its own masterpiece, and you can see the careful thought that the chef puts into each detail. Each sprinkle of spice, or little flower garnish has its special place and is need to bring the dish together, rather than just look pretty. Our meal started with several small welcome dishes which set the stage for what was to come. The first dish was ceviche and maracuja, a type of Brazillian passion fruit. It looked dainty with flowers on top and was served alongside sweet potato chips. This was followed by a delicious kingfish ceviche, and freshly baked bread. As usual, the bread course was one of my favorites, as it was accompanied by a uniquely smoked butter and a small bed of herbs with a tiny pair of scissors to cut them as seasonings for your bread. It was a playful dish that was both creative and delicious. Still savoring the delightful flavor of the ceviche, the sommelier began speaking with us about the wines we'd be trying that night. We started with a dry white Bordeaux which paired perfectly with our first course: Carabiniero prawn, served with tomato, coriander and Thai salsa. Our second course, Balfegó tuno toro, served with artichoke, bottarga and sherry vinegar, was a perfect pair with a refreshing Sauvignon Blanc. While we would not considered ourselves wine experts, both Chris and I were surprised that the sommelier poured the Sauvignon Blanc into a very large wine glass, which would normally be used for red wine. He told us that just like a big glass does for red wine, the larger glass opens up the flavor profile. We were intrigued, and the sommelier offered to do a side-by-side comparison of the wine in both a large and small glass, and we were surprised to taste a significant difference! It's telling about the level of service here, when the sommelier is willing (on a busy night, with a full restaurant) to take the time to go and do a mini wine-tasting just because a guest is curious about something. Other stand out courses from the evening included an incredibly tender Japanese wagyu entrecote from Kagoshima, which was served with grilled carpaccio, onion and sour cream. The dessert did not disappoint as Chef Heilemann presented us with a delightful plum pastry with rich cocoa bean ice cream, paired with a refreshingly sparkling plum wine. Ecco ended up being one of the most sophisticated, yet comfortable dining experiences we have had in all of our travels. Overall, our food was simply delicious. 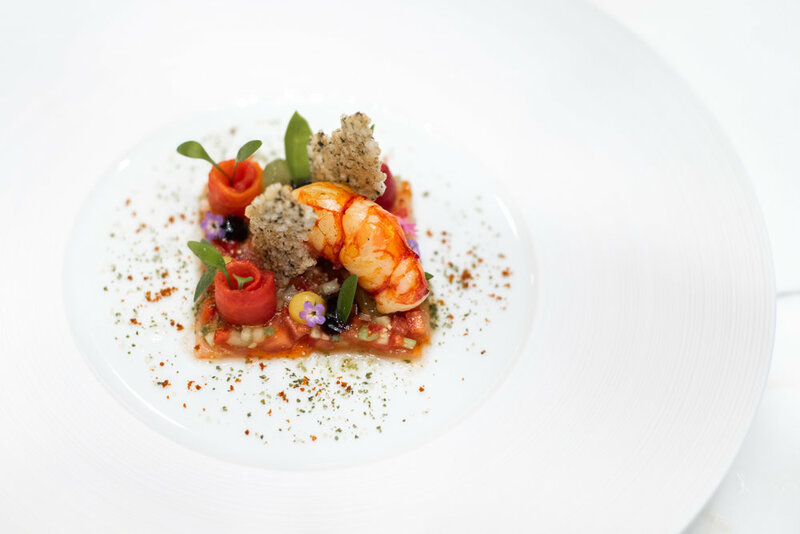 Appealing to all of the senses, each course at Ecco was bursting with color and was so eloquently plated that each dish was its own piece of art. Ecco was elegant, comfortable and relaxing. Our experience was special and one that we will definitely remember.